Equestrians return year after year to ride the beautiful trails and roads in Pisgah National Forest, Dupont State Forest, and Gorges State Park. Many people don’t know, however, that even novices can discover the joy and excitement of horseback riding in Transylvania. 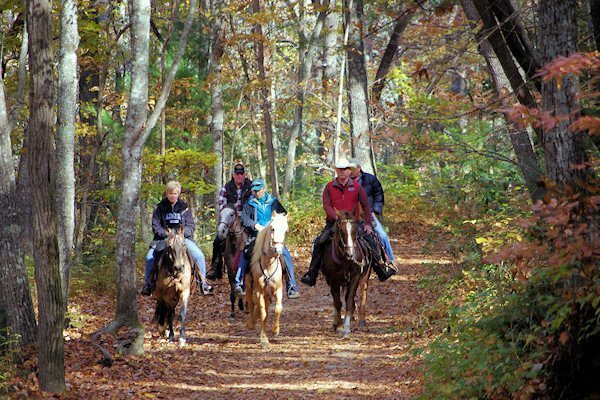 So whether you’re revisiting your favorite trail or looking for a fun new family adventure, there’s no better place to saddle up than Transylvania County. If you plan to ride on your own, be aware that not all trails are open to horses. Get a map before you start, and check signs at the trailheads to make sure they’re horse accessible. The Adventurist’s Horseback Riding Insider Tips offer some great ways to hit the dusty trail. Riding is also offered at the Biltmore Estate. Whether you’re a first-timer or an experienced horseman, enjoy an unforgettable guided expedition through woodlands rich with wildlife on a horse chosen to match your skill level. Call us at 800-411-3812 for details and reservations or click the button below for more info.